Tough cop from L.A. who had lost his parents, meets the murderer in the Little Tokyo, and the show begins - he should fight against Yakuza and one of its powerful leaders. 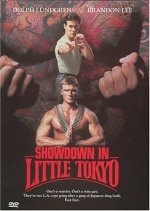 Dolph Lundgren and Brandon Lee unite as two cooperating cops in an all-out war against the drug underworld: athletic Dolph as Sgt Kenner and the cunning, humorous Brandon as Johnny Murata. - One's a warrior. One's a wise guy. They're two L.A. cops going after a gang of drug lords. Feet first.